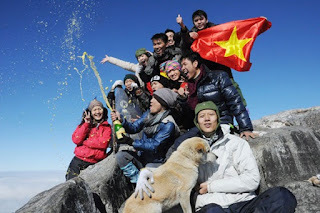 If you are truly one of the adventurous travelers, climbing Fansipan is most likely on your Vietnam bucket, and if it's not yet, then it should be to satisfy your passion. Mount Fansipan is the highest peak in Vietnam, a towering mountain above the Hoang Lien Son mountain range in the far north of the country. The hike will take you through misty bamboo forests and over golden rice terraces, all the way up and above the clouds. If you choose to climb Fansipan you’ll spend time in Sapa, mingling with diverse hill tribe members and experiencing some truly incredible mountain scenery. While walking on the road, you'll get some fun ridge walks with panoramic views. Plus, Fansipan doesn’t require any technical special skill that just sturdy hiking boots but it still offers a challenge to those who want one, especially on the more difficult routes. Fansipan tour has three different route options depending on your skill level and how much time you have. So, you should hire a guide who can show you where to go, help carry supplies, and offer cultural insights that would otherwise be missed. All interesting activities of this itinerary will take you on an adventure that you won’t want to miss! Tag: Discover Best Of Northern Vietnam Tours, Fansipan Climbing Sapa Tour 2Days 3Nights (Best Selling), Sapa Tours, Vietnam Package Tours.